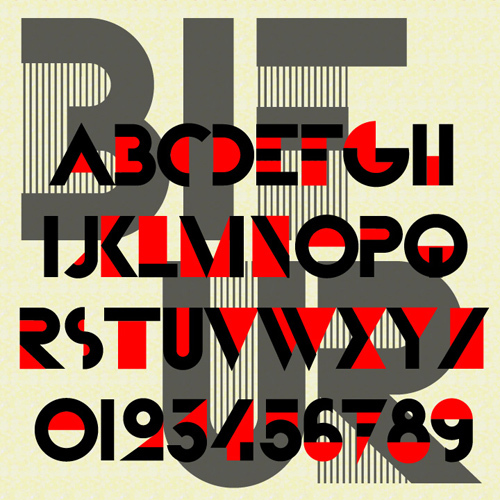 BIFUR is my digital interpretation of the classic analog Art Deco font of the same name. Bifur was designed by A. M. Cassandre and released in 1929 by Deberny & Peignot of Paris. The font is remarkable for its visually exciting two-tone Art Deco look and dramatic simplification of the letterforms. Historically produced in variety of 1- and 2-color versions, I’ve re-created Bifur as a set of six fonts which can be combined in layers to easily create high-resolution text graphics. At long last, I’m offering this as a set of opentype fonts. You can use Bifur Classic or Classic Bold alone as a 1-color font. Or combine Part 1, the solid part of the Classic style, with Part 2 as light or dark stripes or solid in a contrasting color. This font has the limited character set of the original. Pair it with another Deco or geometric font for longer text and greater legibility.